While an overabundance of menu items at a restaurant is often a good problem to have, the fact of the matter is that our stomachs have limited capacity. And as such, some of the more eye popping options at New York City outposts are forced to be eschewed to the dreaded – ‘we’ll try that next time’- which let’s be honest, never comes to fruition. Conceptually however, a restaurant like Burger & Lobster is refreshing because of it’s uniquely limited menu – you know exactly what your choices are before even stepping foot inside of the cavernous space. Heck, it’s even in the title. And while the first New York City outpost of the London brand has expanded their menu by way of different condiments and options, their core of three distinctive- and fairly priced- selections still remains as the place’s most prominent drawing card. Since opening it’s original location with just three choices: a juicy burger, a fresh lobster or a lobster roll – all for just $20, served with fries and a salad- both the menu offerings and prices have expanded in kind. But this is New York City, where a $25 lobster roll or a $28 lobster doesn’t scare us – and fortunately in terms of both flavor and value- it shouldn’t scare you either. 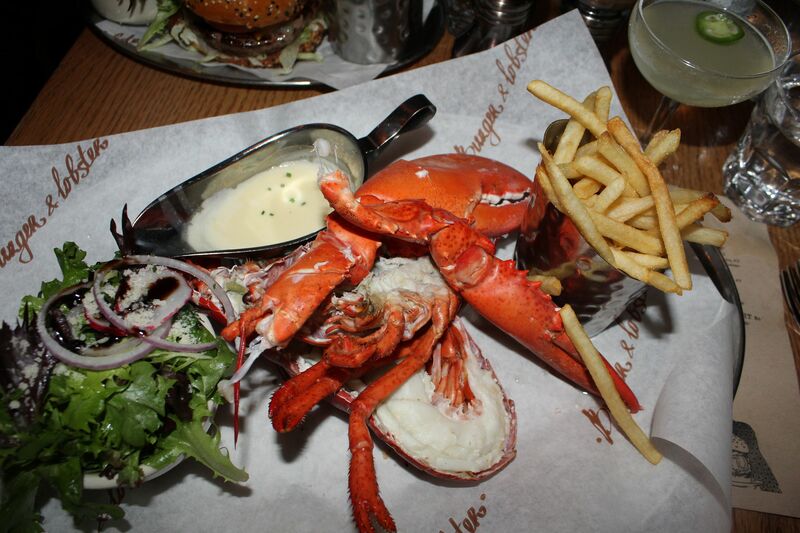 Most surprising is Burger & Lobster’s sheer size. The place is absolutely spacious but is also brightly lit up and simply feels like a clean, comfortable setting- one that is absolutely ideal for large groups to gather together and chow down. 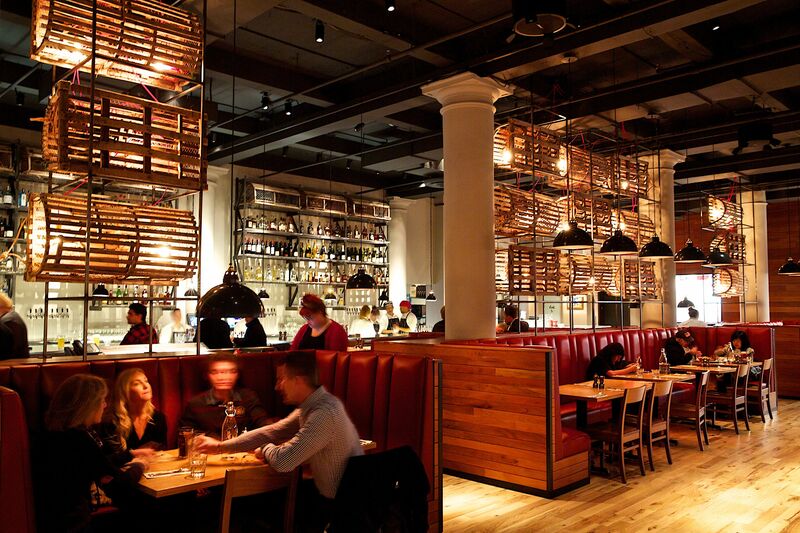 The decor is a seemingly unnatural blend of contemporary New York meets an Americana fast casual style- but its atmosphere definitely works with red leather banquettes surrounding a mostly wood paneled space. Inventively, wooden lobster tanks segregate the sizable bar area from the dining room in non-obtrusive but still eye-catching manner. 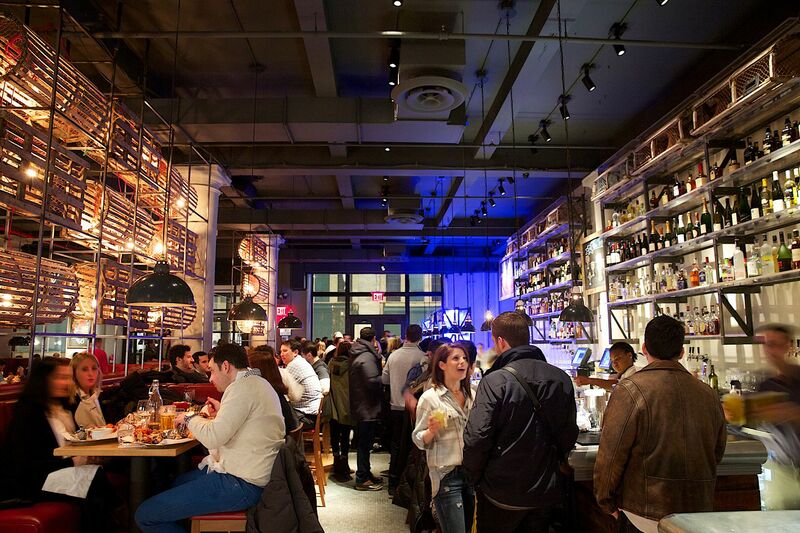 But enough about the tables and chairs- it’s the food that you’re trekking to the Flatiron District for- and it’s the food that will reward you in kind. Notably, each of the portions are entirely generous given that a silver cylinder of salty French fries and a small garden salad accompanies each order. To wash down much of the hearty fare, a pour of “The Beer” ($9) was a particularly refreshing order. Created specifically for the New York City outpost by Brooklyn’s Sixpoint Brewery, the Pale Ale style was deliciously hoppy without being overwhelming, a definitive complement to a massive burger dubbed “The Original” ($20). 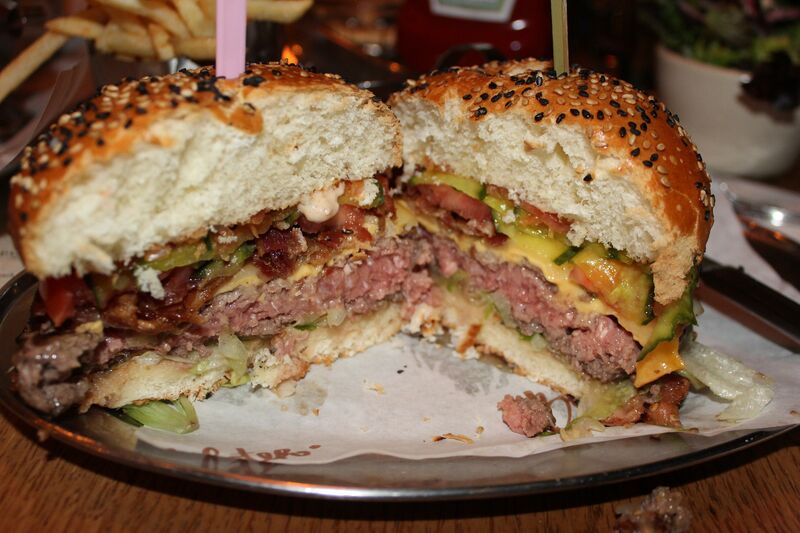 On a night that left us so amped up for lobster, the burger itself was the evening’s nicest surprise. Perfectly cooked to a medium-rare temperature, the 10 ounce blend of well seasoned Pat LaFrieda beef meshed wonderfully with an outlay of cheese, lettuce, tomato, onion and crunchy pickles. Best of all, the entirety of its components stayed in tact throughout our meal- no gooey, soggy buns on this night- a definite plus for City burger-seekers. Equally impressive in size was “The Original” ($28) lobster. One and a half-pounds of freshly cracked Nova Scotia meat, plucked from the shell and tender to the taste. There are two other size options depending upon one’s level of hunger, but the medium portion was more than filling enough- served either grilled or steamed. Dipped in a small vat of drawn butter, the succulent lobster meat was rich and juicy- a decadent serving of delicious opulence as the liquified butter drizzled down our smiling chins. Our only gripe here was temperature- we would have preferred a piping hot claw to the slightly warm style that was served tableside. But fortunately, the flavor profile still managed to remain tasty. The Japanese mayonnaise lathered lobster roll- also dubbed “The Original” ($25)- meanwhile, was the lightest in terms of size, but damn if it wasn’t exceptional. Overflowing with hunks of claw meat, the creamy combination mixed with bright green chives and a buttery potato-brioche bun made for a particularly memorable take on the traditional northeast sandwich. The knock on B&L’s “Lobster Roll” has been that it’s a bit bread heavy and while that criticism is not necessarily unfair, it hardly detracts from what is otherwise an intensely delectable dish. Sure you can order “The Fiesta” served with chipotle mayo or “The 7 Samurai” equipped with a cucumber, sesame and ginger blend- but “The Original” served our group just fine. The space is huge but is bright and inviting. The menu is limited, but there is seemingly no wrong way to order. The drink list is reasonably priced and there is plenty from which to choose. 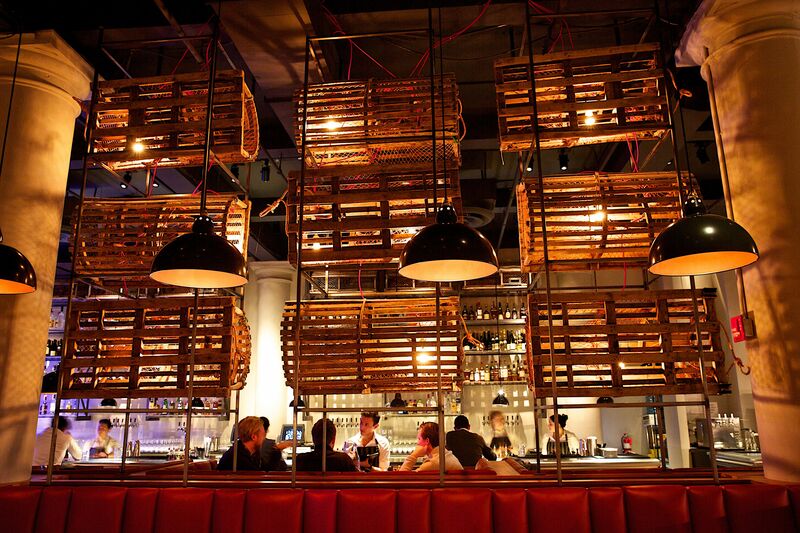 Most importantly, the entire dining experience simply feels vibrant, energetic and fun. That is of course, until you’ve left a sea of napkins on top of the remains of what was once a nice looking lobster roll or burger- for at the end of the meal, you’re almost certain to need a long walk home.